I thought it would be nice to start Metta Skincare review with a simple admition that while I like using balms on my skin, until I tested Metta I never had a face & body balm & oil only routine, which made for compelling trialling. 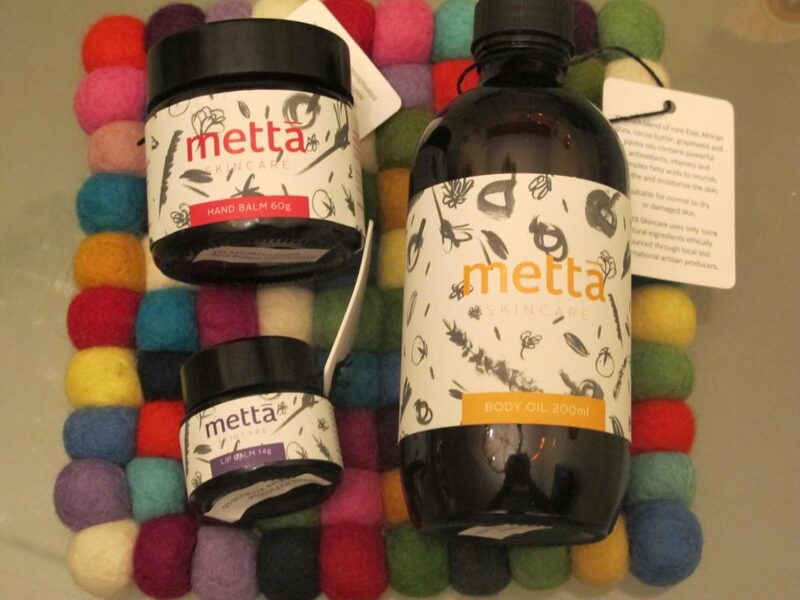 Metta Skincare is an Australian range of products for face & body that is created not only to care lovingly for your skin but it also has environmental and social consciousness. Anca Grigoras, Metta’s founder, wants you to take the time and look after your skin with love and care that you deserve so each of Metta’s product is crafted in small batches in order to ensure optimum freshness and potency. Face Balm: according to Anca ‘ it is an intensive night-time treatment designed not only to replenish moisture and restore skin’s suppleness, but also to deliver a powerful combination of vitamins and antioxidants to help prevent free radical damage, one of the leading causes of premature skin ageing.’ This beautifully bright, orange balm is formulated with East African shea butter, botanical ingredients and cold-pressed pomegranate, olive fruit, macadamia, jojoba, raspberry and seabuckthorn oils and is suitable for dry, mature or environmentally stressed skin. I would probably also use it in the summer, as this balm is rich and nourishing, feeding your complexion and soothing it as well. Metta face balm smells of calming lavender & uplifting rosemary which creates an energising yet peace-inducing smell that lulls you to finish the day in a comforting cocoon. Lip Balm: this balm ‘is based on a special combination of oils which have been traditionally used for centuries to protect the skin from the damaging effects of elements like heat, wind or cold‘. When you unscrew the lid you smell cocoa which for me is always a guilt-free, happiness inducing smell. This moisturising & delectable, dessert-smelling balm combines jojoba seed, sweet almond, coconut, cocoa seed oils with lavender essential oil and makes your lips feel soft and plump. I found that while I love the smell, there was no need to re-apply the balm too often, which is a good indication that the formula is adequately nourishing, unlike many lip products that your re-apply often, yet feel like your lips are only becoming drier. Please bear in mind for future reference that good skincare is a daily pleasure that should nurture and nourish without any adverse effects. Metta Lip balm is also a wonderful product to apply to your kids dry lips or to give to your daughter or niece as part of their first teen skincare routine, as the smell alone will appeal to the young ladies who can’t wait to grow up. Hand Balm: the skin on our hands is prone to dryness ( how many of us wash the dishes with gloves or wear them when the temperatures outside dip right down ?) and are often one of the first indicators of our true age. Anca’s aim when creating this balm was to protect our ‘hard workers’ with the moisturising blend of olive oil and shea butter, also adding calendula to help heal minor cracks which appear on our skin when the skin becomes too dry or sensitised. Twirl your fingers in the balm and then spread it all over your hands and between your fingers, where the small cracks can appear if you don’t dry your hands thoroughly. Your hands will smell of comfort and contentment thanks to calendula and lavender, ready to embrace people your love, while being protected by the subtle protective veil. You can also massage this balm into your cuticles, nails, as well as dry heels or elbows. A perfect multi-tasker ! Body Oil: this lightweight blend fuses together grape seed, macadamia, sweet almond and jojoba oils that are formulated to replenish moisture and soften the skin. Anca designed this body oil primarily as a body moisturiser but it can be used as a massage oil ( perfect if you have a massage therapist coming to give you a treatment in the privacy of your home, for a partner to massage you or for you to do it at the end of tiring day, untangling your tight muscles ). When I distill a couple of bottle caps into the bath water, it makes my bath more enjoyable and helps to lock in the moisture into my skin. Just remember to gently pat skin dry when coming out of the shower, leaving it slightly damp. Anca also gave me a tip of combining Metta body oil with sugar or salt ( I use Himalayan salt because of the amount of minerals it contains ) for a very effective skin polish – it works perfectly on dry elbows or knees as well. Body Butter: according to Anca, when she created this particular product, she ‘envisaged it would be an open invitation to set aside the worries of the day and take a few moments to reconnect with ourselves – to breath in either the soothing and relaxing scent of lavender or the sweet and happy vanilla and envelop our skin in a rich elixir that feels both nourishing and comforting‘. When it comes to my own impression about this product it started with a bang. Anca kindly sent me the parcel with products from Australia and the brown box arrived looking perfect. However, even though each product was wrapped securely & individually in the bubble wrap, the glass jar of this one was smashed, including the lid – to this day it remains a mystery how it could happen, when every other product, as well as the packaging box, were intact. However when I smelled Metta Body Butter, I just couldn’t put it in the trash. Instead I took the spoon out and ‘rescued’ some of it from the inside of the jar and deposited it into a clean Bonne Mamman jam jar. Since then this product became one of my absolute favourite body products. It feels like a sold cream before you warm it up between your fingers and then it turns into a buttery cream consistency. It also smells so delicious, you want to eat it like a hungry child in front of cookie jar. Instead you luxuriate in its delicious softness and observe a delicate sheen that it imparts on your skin. Apply it before a party or going our dancing, when it warms up on your skin and makes you feel like a delicious dancing queen. Or curl up in bed with a book or sit and meditate on a yoga mat – either way it is a beautiful product that feeds the skin and makes your mind happy. For more information about Anca Grigoras, read my interview with her here or go to Mette Skincare website here where exciting developments and new launches are promised to appear in 2015. Personally, I can’t wait as this whole range is one of my personal favourite discoveries of 2014!